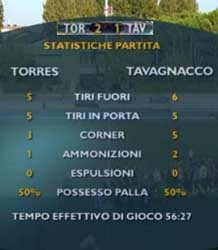 Torres beat Tavagnacco and also won the 2011 Italian Super Cup. The Sardinian team with this victory completes an exceptional season and begins the new season under the auspicious. The start of the game, which took place six minutes late, makes us think of the classic start of the season, with long teams aware of being still in full athletic preparation, more attentive to pretension than to choral play. It will not be so! A sprazzi was also seen the good game and a great desire for victory from both formations. In my opinion, the two teams have conquered once each and Paola Brumana best player of the match. At the Torres goes the first time in which he created and exploited, with an infallible Panic, the opportunities of the double advantage. The recovery was of yellowblue brand. The Friulians, after having shortened the distances at the end of the first 45 'with Brumana - in great sprinkling - in the second half have put a strain on the Italian champion in office even if they have not managed to equalize the fate of the meeting: first erroneously a penalty, then with a bit of bad luck and finally hitting a crossbar. A good game, broadcast by Rai Sport live web without comment, we can see Monday 12 September deferred at 17 when in practice everyone is at work and the promotion of women's football will see a few. Despite this small and necessary controversy, the game was pleasant and we have seen two teams that will again be among the main protagonists of the upcoming championship - if the calendar will be released - to which we hope success also in the Champions Cup. The two teams have strengthened and will have more weapons available for good performance. Torres seems to have put the right people in the right place, the Tavagnacco has made more insertions and, in my opinion, need more time to amalgamate game and synchronism.